Happy Friday eve! 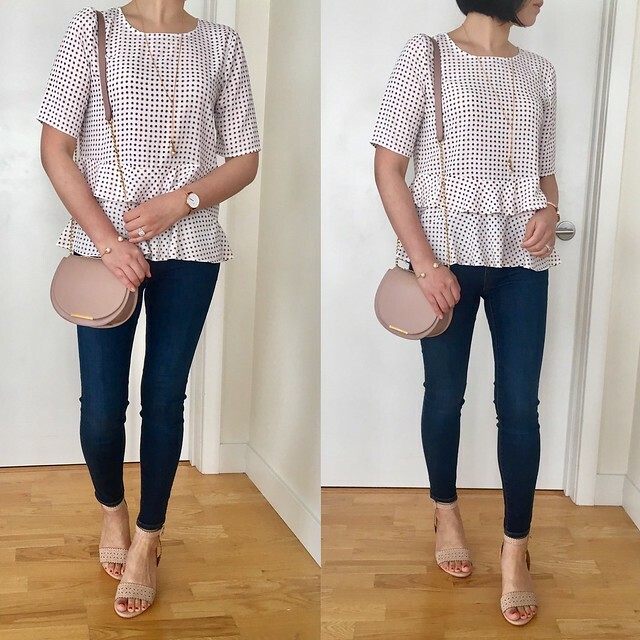 I bought this adorable daisy ruffle hem top last weekend in store (it’s also available in navy blue). It fits true to size since size XSP fit me comfortably in the overall fit and length. Refer to this clip for another view of the fit on me. Up close the dots look like little abstract flowers. I admittedly don’t give enough love to the cramped sales section at the Prudential store but I looking for a specific sweater dress to try on since Su @allaboutloft recommended it. Some of you may wonder why I mention Su quite frequently and it’s because she helps me out a lot behind the scenes. 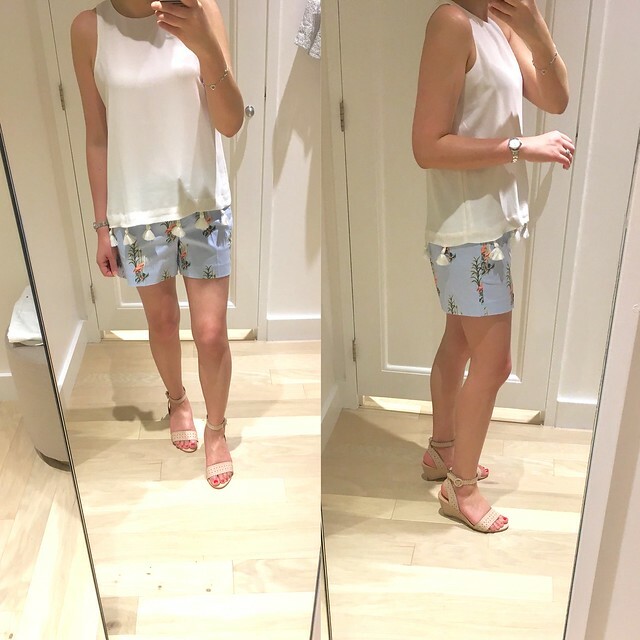 We try on a lot of LOFT and Ann Taylor and we confer on sizing before we order online. She’s my online shopping buddy and we typically take the same size too. 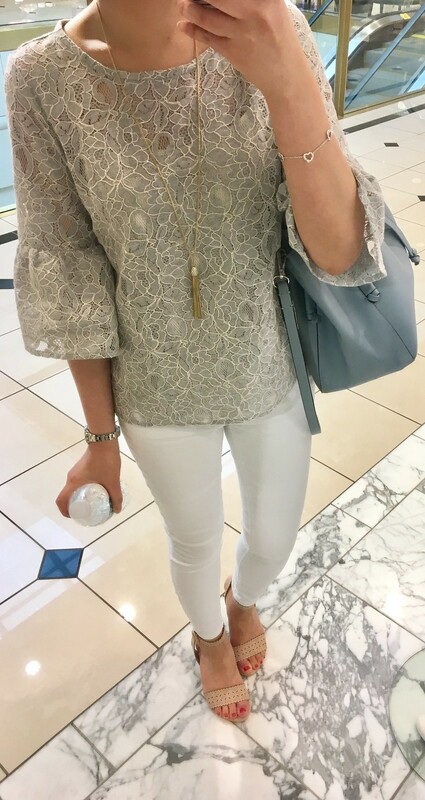 I love this lace top so much but the sizing does run about one size bigger so you may be able to snag it if people return it due to sizing issues. I have also seen a few of the larger sizes in stores in the racks and I wish this top was offered in petites. The lace is really pretty in person and it’s sure to get a lot of compliments. A lady in store came up to me just to tell me how pretty the top was and I was happy to tell her it was from LOFT. 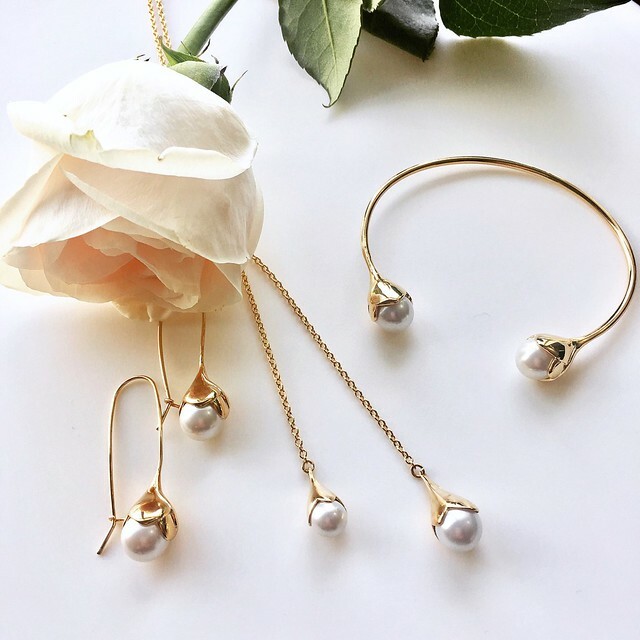 I love pearls so when I saw this pearlized flower set I had to order it to see the pieces in person (of course I wish I waited to purchase so I could use my Ann Cares card for extra savings but I guess you can’t win them all). I love the gold tone against the luster of the pearls. The necklace is also available in silver. 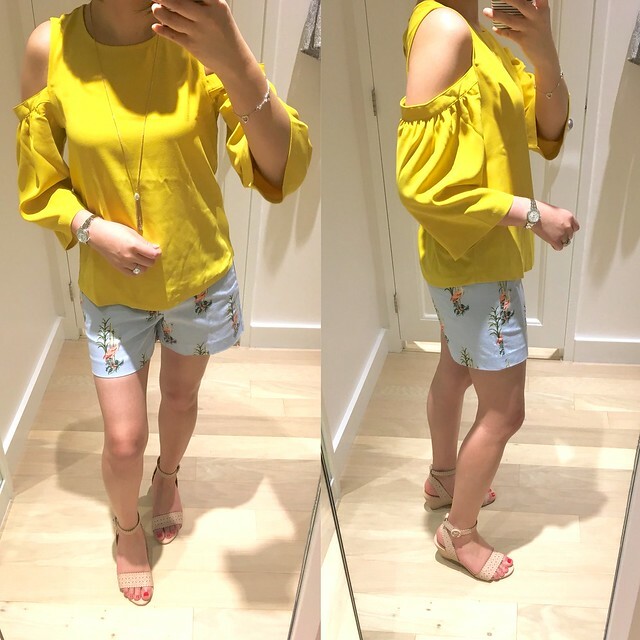 I had to have this paradise blouse after seeing it on Jen of @skirttherules. I bookmarked this top on my phone and I ordered it when size XSP popped back one day. I tend to have the most success with pop backs in my size in the early mornings around 5-6AM ET. The material is slightly sheer so a layering cami is recommended. 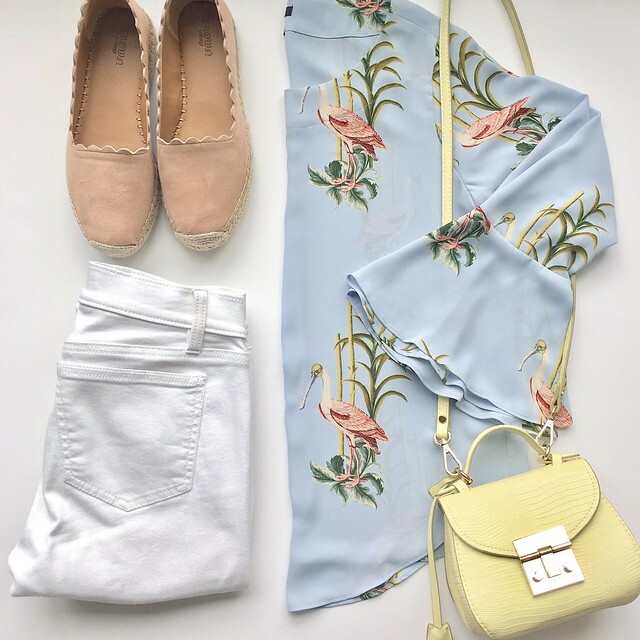 I found that it fits true to size for a loose and flowy fit. Get 40% off (almost) everything at Ann Taylor. Use code FORYOU. Valid in stores and online. I have been in stores searching for enough full-price promotional items in order to make use of my Ann Cares card before it expires on May 14th but the sizing or the selection just hasn’t been in my favor. 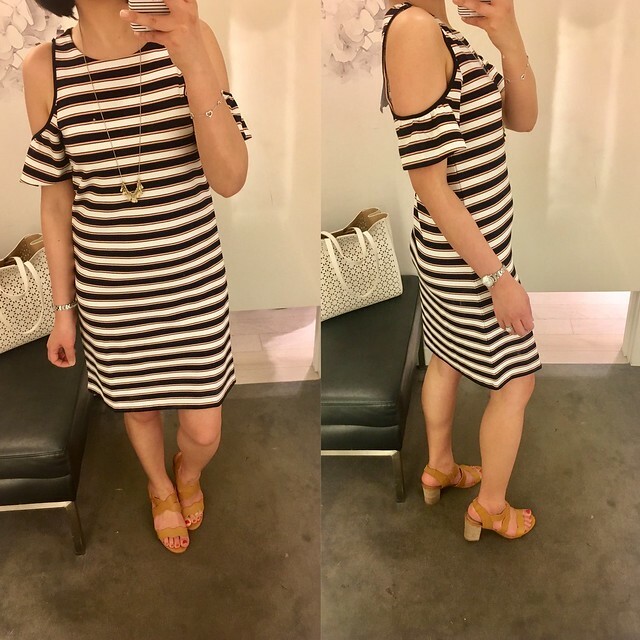 This stripe cold shoulder dress is so soft and comfortable. It does run slightly larger since I was able to fit size XXSP while I usually take size XSP at Ann Taylor. It’s also available in black which I would love to try on since you can never have too many little black dresses. 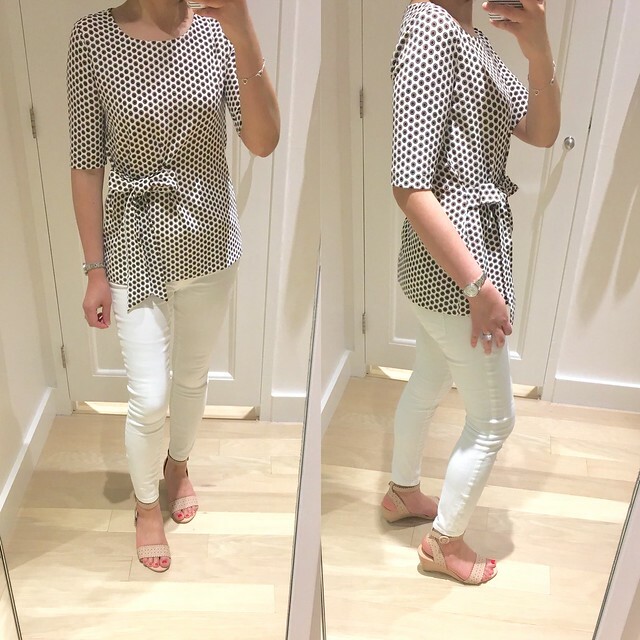 I originally ordered this bow front top in white and sky blue in size XXS regular before I was able to try it on in store. I ended up trying on size XS regular in store before I received my order which fit me comfortably but I didn’t love the white and sky blue colors on me. I found the dot print a lot more flattering since there is a noticeable seam running down the back. The material is thick enough that it isn’t too see through in the white or sky blue colors. Refer to this clip for another view of the fit on me. This ruffle cuff blouse was on my wishlist and it runs one size bigger. Size XXSP fits me well but the material is sheer and requires a layering cami. I passed on it for now since I’ve been trying to limit the sheer items that end up in my closet. This cold shoulder top was also on my wishlist but I wasn’t a fan of the color in person. It’s also available in a striped version. It does have a shorter length so I would recommend getting the regular missy sizes unless you’re really petite or have a shorter torso. I tried on size XS regular but need my usual size XXS regular for the best fit. I also love the embroidery and pattern on these paradise shorts but the width of the legs are too wide for my chicken legs. I’m not sure if petites would fit any better but I’ll keep a look out for these shorts in the sales/clearance racks. 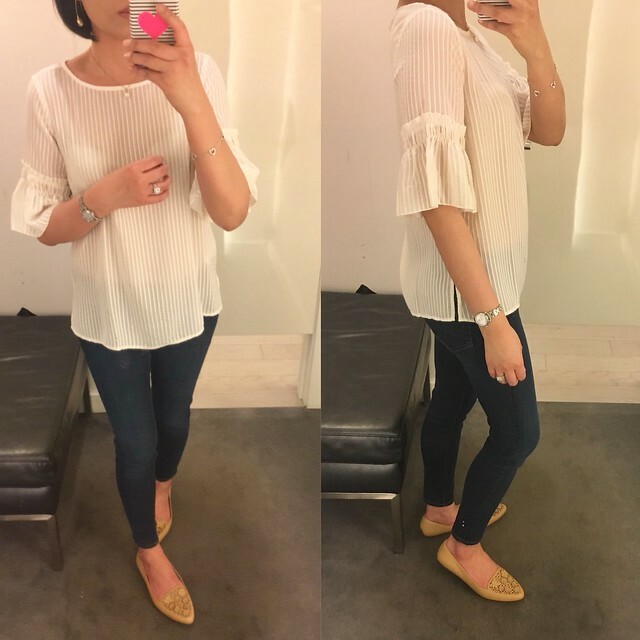 This tassel shell is a great layering top or worn alone but it does run loose and big. For some reason I mentioned that I tried on size XSP in this clip but I checked the picture of the tag and I tried on size XXSP which fit like size XSP. I noticed that from the sides it does look like a tassel is missing since they didn’t sew a tassel in the middle seam so there is a noticeable gap. 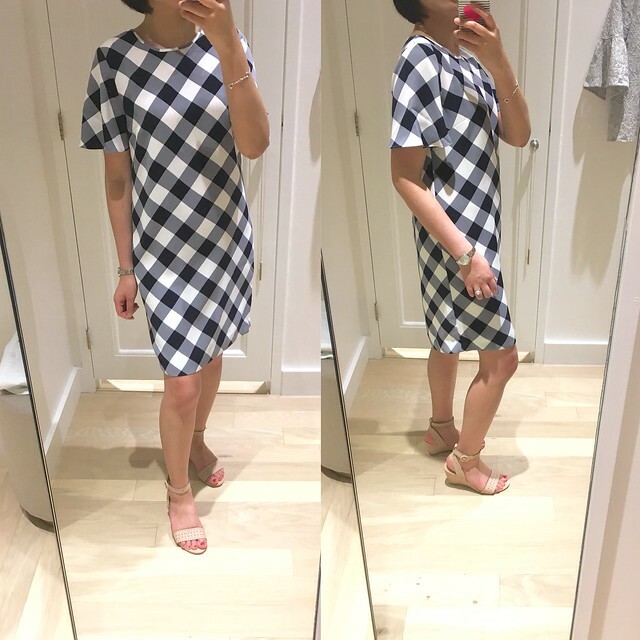 I tried on this gingham ruffle sleeve dress since I saw a few ladies trying it on. The regular missy size is a modest overall length for petites. I tried on size 0 regular which was a bit loose and shapeless on me so I would prefer size 00 regular for a more flattering drape. The dress is cut straight up and down so if you’re curvy then this dress may pull funny at the bust and hips. I like the subtle ruffle of the sleeves but I’m not a fan of the larger gingham print for myself. Luckily it’s also available in solid colors here. Refer to this clip for another view of the fit on me. 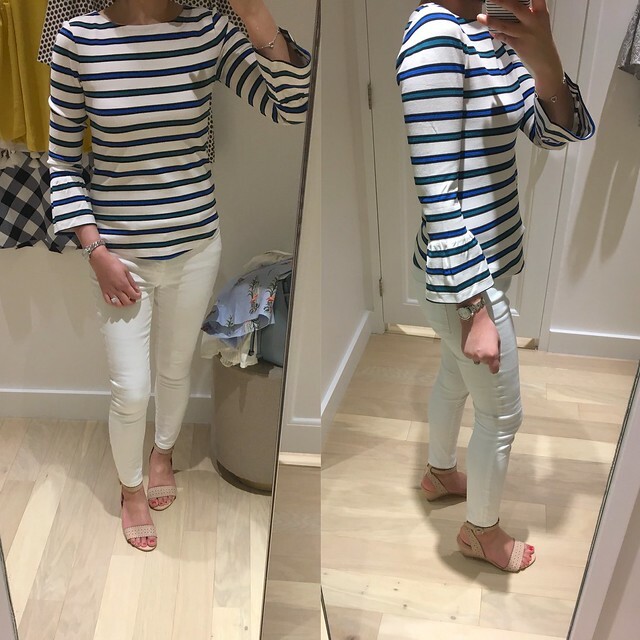 Lastly, I tried on this stripe bell sleeve top since it looked really cute with the colorful stripes against the white but this top runs really short and snug. It’s so snug I recall sucking in my stomach for these pictures because it shows every bump due to the tight fit throughout the body. Even the sleeves were snug on my upper arms. I would suggest going up at least one size for this top for a more comfortable fit. 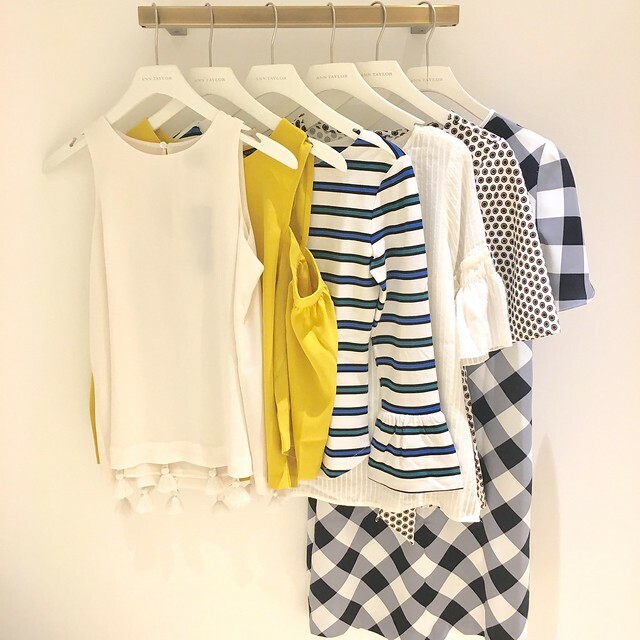 Due to the cropped length, the petites sizes will be very short (belly button revealing) so I would recommend trying the regular missy sizes for a longer overall length. I have no idea why they would make this top so short and it even looks short on the model in their online stock image. Have a lovely Mother’s Day weekend!